Summary: When the California drought escalates to catastrophic proportions, one teen is forced to make life and death decisions in this harrowing story of survival from New York Times bestselling author Neal Shusterman and Jarrod Shusterman. 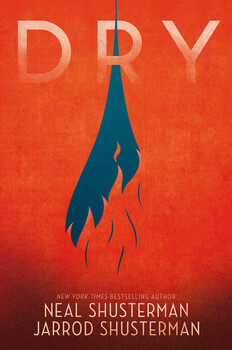 The drought – or the Tap-Out, as everyone calls it – has been going on for a while now. Everyone’s lives have become an endless list of don’ts: don’t water the lawn, don’t fill up your pool, don’t take long showers. Until the taps run dry. Well, too many dystopian fantasy books I have read, but Neal Shusterman will always prove that there’s still more to explore in this genre. Who would have thought that in the future water would be so rare that what if one time, one day, the source of water just run out? Perhaps, that’s the story of this book. It’s started normal, people trying to survive by limiting the amount of water they could use per day. And one day, they have to face the fact that the water stopped. No more. The world building, as always, magnificent. All was explained in right proportion. Then we meet the characters. I always think that Neal has to do something with the characters he made. Before, it was fine, because it all matched with the stories, with the plot. However, this time, I have to say, despite being human (as in no exaggeration of the characters’ traits, 3D in some cases), I couldn’t feel the connection. Sure, they were in a journey to find water. Sure, they were doing something. But I couldn’t even remember the name and what’s going on with them. I couldn’t really careless. However, the story was a bit interesting, not like Neal’s usual trait. Still it deserved it’s praise. It’s simple and yet it made a good story. I still think that Neal could explore more of the story. Perhaps it’s a standalone, perhaps that’s why not much could be said and done. But still, with Neal’s record of making good plot twist, the ending was not something I would expect. Yet, this is the first collaboration between father and son. So, perhaps we could see more of this in the future.